Soteria Solutions provides new approaches to prevent sexual and interpersonal violence and harassment. We work with you to activate bystanders at all levels, to create lasting change and build a safe, respectful, and sustainable culture in your organization or school. Soteria Solutions fosters collaborations with our partners that leverage individual and organizational strengths to build safe and respectful learning, working, and living communities via training, consultation, and implementation of proven prevention and response strategies. In study after study, students and employees report that they regularly experience sexual harassment and assault in schools and workplaces. 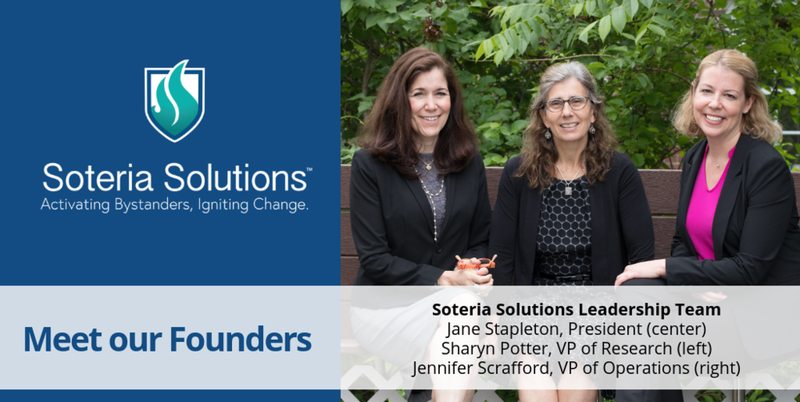 Soteria Solutions was founded by Sharyn Potter and Jane Stapleton, who previously founded the University of New Hampshire's Prevention Innovations Research Center. Sharyn and Jane have dedicated their careers to researching and developing the most effective strategies to both respond to and prevent sexual and interpersonal violence and harassment. A 501(c)(3) organization, Soteria Solutions works with partners to engage bystanders and build safe, respectful environments. Below are highlights from recent studies. You can learn more about these statistics and their sources on our About page. Built on a foundation of consistent principles, research, and evidence-based approaches, our resources are tailored for specific partners: high schools, colleges and universities, and workplaces including the military. Based on the acclaimed College Prevention Program, the newly launched Bringing in the Bystander® High School Prevention Program was evaluated at 26 high schools with funding from the Centers for disease Control and Prevention (CDC). BITB High School curriculum is designed to fit into a typical high school day. Schools can take advantage of mentoring, implementation support, and Train-the-Trainer options. The Know Your Power® Bystander Social Marketing Campaign, along with consulting and evaluation services round out resources for high schools. Soteria Solutions' flagship resource, Bringing in the Bystander® College Prevention Program, is currently in use at over 400 colleges and universities in the U.S. and other countries. This program includes a proven curriculum offered in both 90-minute and 4.5 hour versions, as well as regional Train-the-Trainer courses. Additional resources for colleges include the Know Your Power® Bystander Social Marketing Campaign, consulting and evaluation services, and technical assistance. 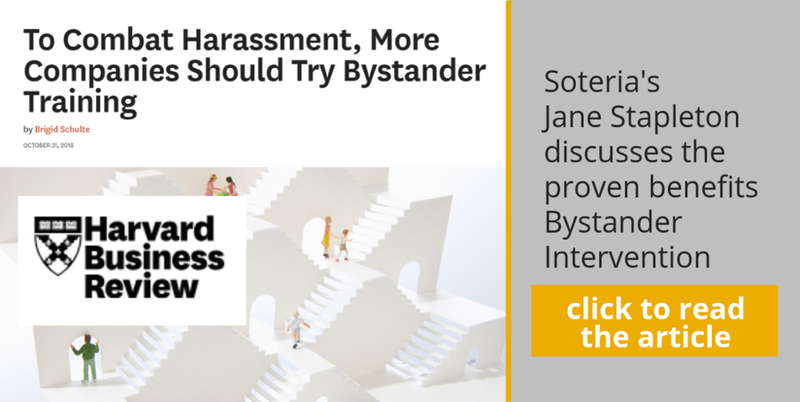 Developed through one-on-one consultation with corporate and military organizations conducted by the Prevention Innovations Research Center, Soteria Solutions offers Bringing in the Bystander® Workplace Prevention Program, enabling organizations to build safer, more respectful work environments. Evaluation and consulting services are also available, as are training and technical assistance. 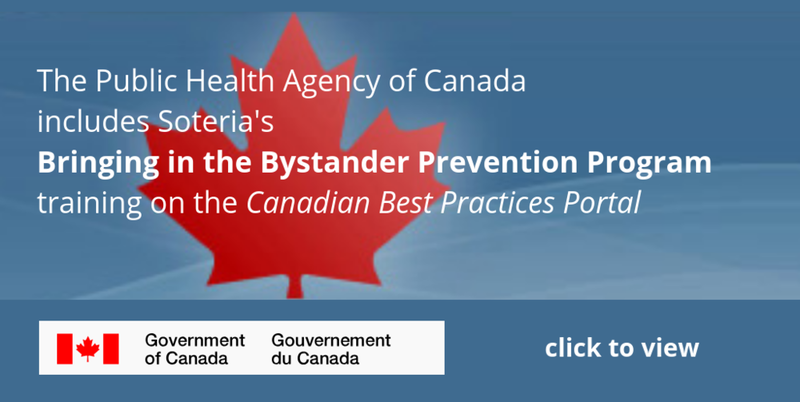 Rather than focusing narrowly on perpetrators and victims, the highly interactive, researched and evaluated Bringing in the Bystander® Prevention Programs use a community of responsibility approach. They teach bystanders how to safely intervene in situations where an incident may be occuring or where there may be risk. The programs are customizable to reflect the locations, colloquialisms and culture of your school or organization. All Soteria products are based on research and evaluation conducted by the Prevention Innovations Research Center at the University of New Hampshire. "Facilitating Bringing in the Bystander on the CSCU campus has been a great experience. Students appear to really engage with the material and have open, honest discussions about sexual violence in our community, and the roles each of us can play in prevention. This program has been a strong addition to our prevention programming and the feedback from students has been excellent." Soteria Solutions offers training courses tailored for high schools, colleges, and workplaces. We offer Train-the-Trainer sessions, to ensure your facilitators can confidently train students and employees. Along with standard curricula, we provide supporting materials and continuing support to ensure your success during implementation. At the college level, schools and their partners may elect to host a training at their own institution or join another institution's training. Soteria Solutions publishes a calendar of open sessions on our training page. Consultation services can provide colleges, universities, workplaces and their partners with technical assistance focused on the development, implementation, and evaluation of prevention tools and frameworks, compliance strategies, survivor services, research measures and strategic planning to effectively address sexual and interpersonal violence and harassment in their communities. Receive technical assistance grounded in research, theory and evidence-based evaluation. Build capacity to comply with Title IX, VAWA, the Clery Act, Title VII, and state laws. Design strategies to create and sustain violence free learning, working and living environments. Soteria Solutions builds on the work of the Prevention Innovations Research Center at UNH, as well as other scientific research and best practices in preventing and responding to sexual and interpersonal violence and harassment. We know that the cost of these public health problems is high to both individuals and communities. That is why Soteria Solutions invests in and disseminates scientifically proven effective practices that are informed by the people who are most impacted by these efforts. We build collaborative relationships with community partners. These partnerships are crucial to the prevention and response strategies that Prevention Innovations Research Center has developed over decades. Soteria Solutions will continue to shift the prevention and response paradigm by establishing effective partnerships, which intentionally analyze the needs of practitioners and survivors to identify solutions that build safe and respectful working, living and learning communities. Meghan Stewart from the UNH Prevention Innovations Research Center spoke with experts from the University of Kansas and the University of Windsor to learn how they adapted Bringing in the Bystander to meet the needs of their indiviudal campuses. Sharyn Potter, our vp of research, and Jane Stapleton, our president, discuss the critical elements of successful prevention programs, and the unique role high schools and colleges can play in facilitating the cultural change that will reduce sexual and interpersonal violence and harassment in our education systems.